NYC, 04/29/2019, 10:00AM. Birding Basics: The Ramble. Located along the Atlantic Flyway, Central Park welcomes more than 270 migrating bird species each year. Learn the basics of bird identification while exploring the Ramble, a vibrant woodland habitat and a tranquil spot to meander along winding paths. 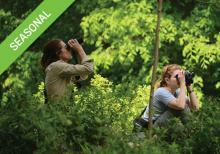 Explore its variety of wildlife, while learning tips and tricks for spotting and identifying birds. Bring your own binoculars or borrow a pair from our tour guides.